We love this veggie gratin so much because it’s one of those awesome dishes that’s hearty enough to be eaten alone or as a side – and it tastes as amazing as it looks! We like it over creamy polenta and crusty bread, and it goes great alongside meat, poultry or fish. Feel free to switch out any of the vegetables for other seasonal choices, too! This really is as versatile as it gets, and the ingredients will keep well in the fridge overnight, so you can slice and assemble it a day ahead. Easy, delicious and colorful, this is one of our favorite summer vegetable recipes, and perfect for bringing to that next potluck! Preheat oven to 425º F and move oven rack to the middle slot. Grease a shallow 3 quart baking dish. In a large bowl, combine garlic with olive oil and pepper. Using your hands, gently toss eggplant and tomatoes in oil to coat. 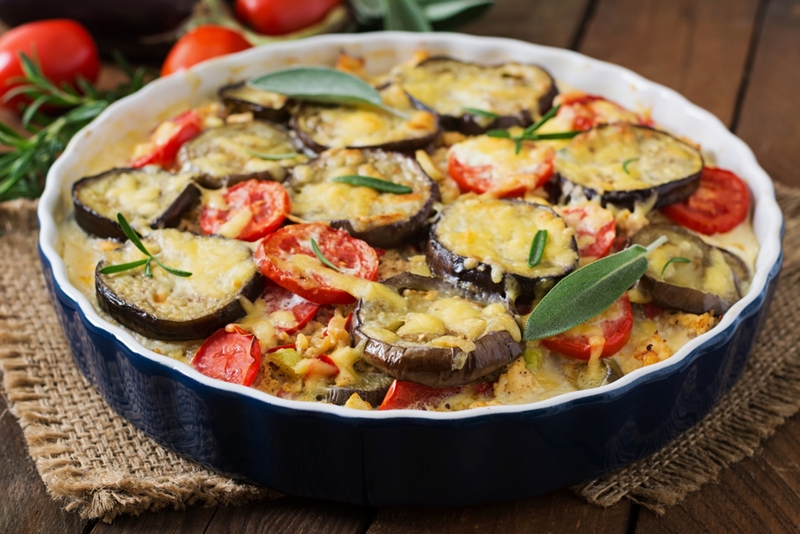 Place eggplant and tomato slices into baking dish. (Don’t worry if they overlap!) Spoon the remaining olive oil and garlic over the top. Cover with foil and bake about 1 hour, until vegetables are soft. Uncover and sprinkle swiss or gruyere and parmesan cheeses over the top. Bake, uncovered, 10-12 minutes more, until cheese is melted and bubbly. Garnish with fresh sage and rosemary, (optional), serve and enjoy!